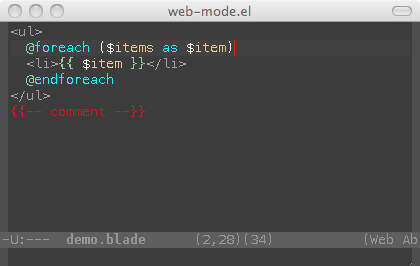 web-mode.el is an autonomous emacs major-mode for editing web templates. 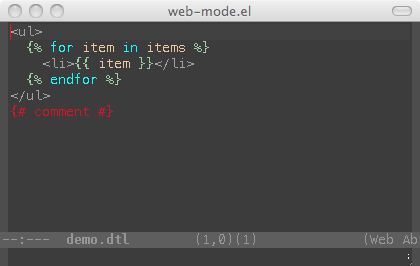 many helpers: dom normalization, element renaming / transposal, attributes sorting, etc. A block is processed (client-side or server-side) before being rendered by the navigator (e.g. a PHP block, an Erb block, a dustjs block etc.). As a result, a block can be located in a part that is embedded in an HTML document. You can download this mode here. 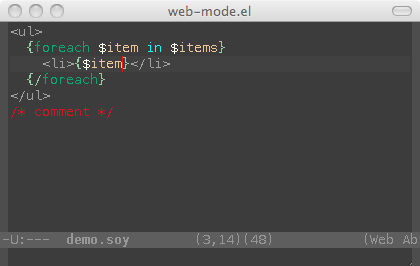 web-mode.el is also available on melpa and on melpa stable. 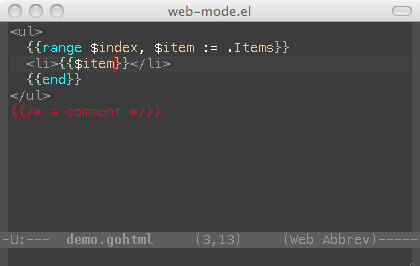 web-mode.el is GPL and Free Software. 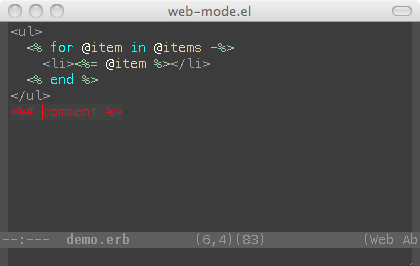 First drop the file web-mode.el in a directory defined in your load-path. 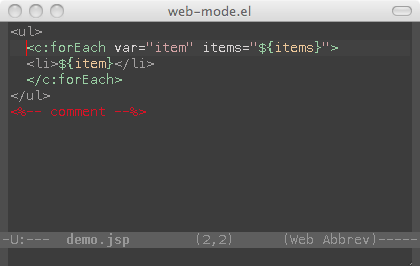 You can also edit plain js, jsx, css, scss, xml files. A specific engine can be forced with web-mode-engines-alist. Using this association list is required as soon as the file extension is unknown (by web-mode) or is too general (e.g. *.html). In summary, you may have to set both auto-mode-alist and web-mode-engines-alist. The recognized file extensions are listed in the Engine families paragraph. 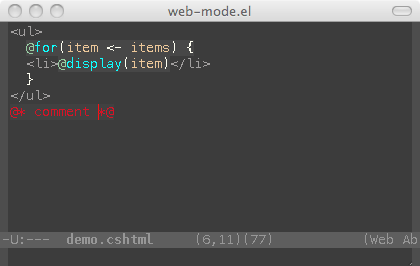 Sometimes, web-mode.el can not guess the content type with the file extension. e.g. 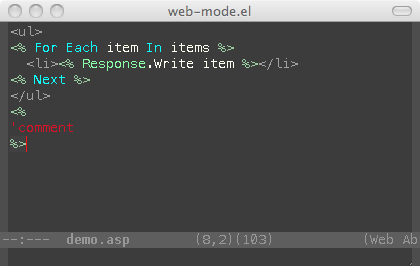 you want to associate *.api files with web-mode. 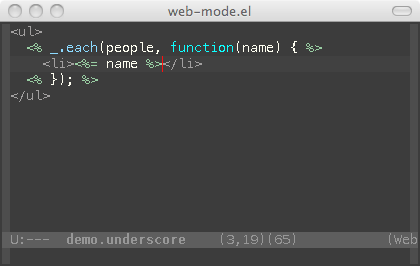 To find a language's name, run the function web-mode-language-at-pos while in a block of it. 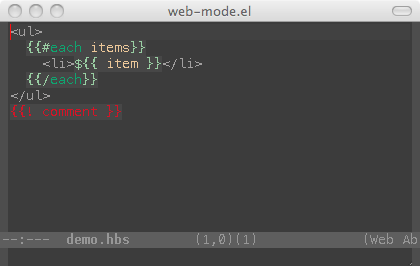 All hooks in web-mode-before-auto-complete-hooks are run just before auto-completion starts. This is useful for adapting ac-sources meant for a single language to web-mode, like ac-source-yasnippet. Never forget to update the auto-mode-alist. Platforms/Compatibility Tested on GNU/Linux, OSX and Windows. 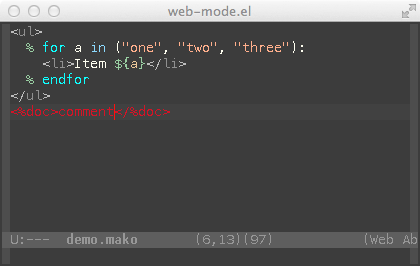 Tested with versions 24 and 23 (some users seem to use web-mode.el with emacs 22). How can I turn auto indentation on ? 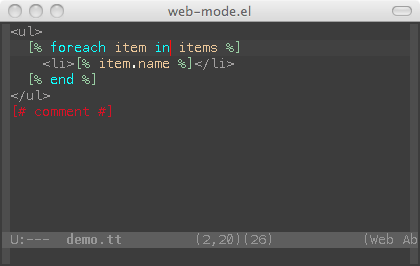 Put this line in the web-mode-hook (local-set-key (kbd "RET") 'newline-and-indent) You can also use M-x electric-indent-mode. 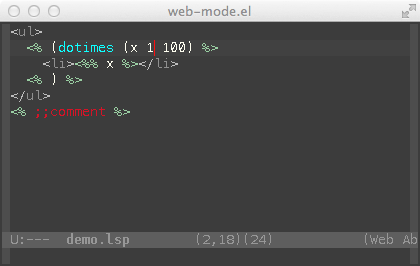 Please note that starting with 24.4, Emacs does this by default. I want to use smartparens (defun my-web-mode-hook () (setq web-mode-enable-auto-pairing nil)) (add-hook 'web-mode-hook 'my-web-mode-hook) (defun sp-web-mode-is-code-context (id action context) (and (eq action 'insert) (not (or (get-text-property (point) 'part-side) (get-text-property (point) 'block-side))))) (sp-local-pair 'web-mode "<" nil :when '(sp-web-mode-is-code-context)) Special thanks to Johan Ekenberg for this tip. Can I contribute ? Of course! You can send bug reports/fixes, feature requests, etc. You can also donate with the button located in the right column. 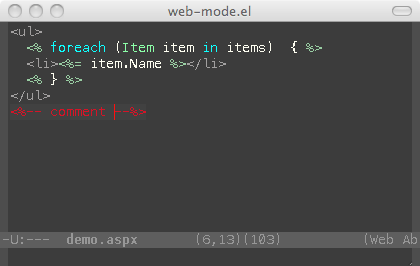 If you want to indent only with tabs, use: (setq indent-tabs-mode t). Moreover you might need to call (web-mode-use-tabs) in your web-mode hook. Syntax coloring does not work Some users might report issues when using themes that not play nicely with web-mode. 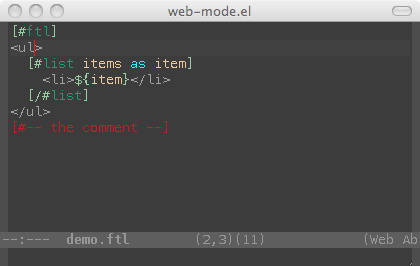 Before reporting a bug about highlighting, try a theme (e.g. Solarized). 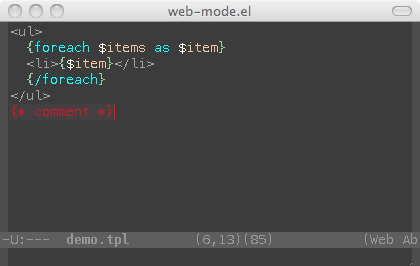 Tips: when using emacs in a terminal, always try to enable 256 colors compatibility (xterm-256color). If you consider that the color of HTML tags too light, you can customize faces like web-mode-html-tag-face or web-mode-html-attr-face. To report a bug, submit an issue on GitHub (note: a screenshot, an example on gist and the output of M-x web-mode-debug are always useful). It may also be a good idea to look at the *Messages* buffer. 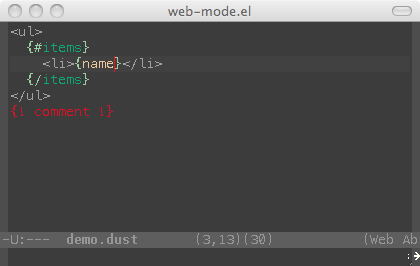 For general questions (install, config, etc), use emacs.stackexchange.com (do not forget to associate the web-mode tag). comment annotation (e.g. 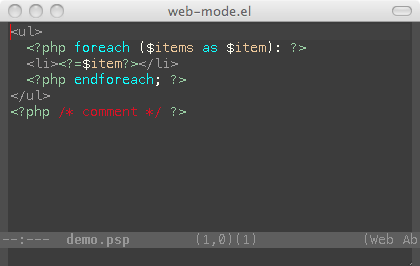 JSDoc, PHPDoc): can be enabled with (setq web-mode-enable-comment-annotation t). Two faces (web-mode-annotation-tag-face and web-mode-annotation-type-face) have been added. mark-and-expand: new state when point is inside an html element ; a selection of the inner content is done before selecting the element. 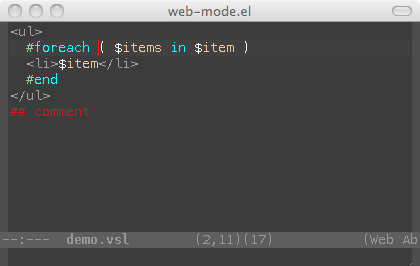 vars: alists web-mode-extra-constants|keywords|types replace web-mode-extra-php-constants, web-mode-extra-php-keywords, etc. snippets / auto-pairing: auto-pairs and snippets are now specific to engines. Founder and CTO of Kernix, Digital Agency (Web/Mobile/Data) in Paris (FR). web-mode.el has been presented to the 7th European Lisp Symposium with the paper: Heterogeneous recursive code parsing with Emacs Lisp.